Mix butter and garlic together to create a paste. Place Lobsters shell side down on BBQ on a high heat. Brush the garlic butter paste onto the lobster meat, leaving a small amount of paste for later use. If possible cover lobsters (using BBQ cover, saucepan lid or stainless steel bowl). Small lobsters usually require 5-10 minutes while larger lobsters up to 20 minutes cooking time. Please allow for more time if the lobsters are cooked uncovered. The lobster is cooked through when the meat goes from a clear/transparent colour to white. 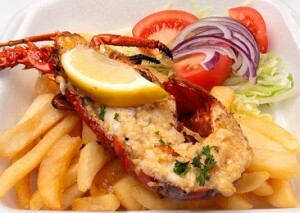 When the lobster meat is white in colour turn the lobster over and grill meat side down for one minute. Place the lobster on a chopping board on its back and stretch the tail out so the lobster becomes flat. Using a sharp knife, cut through the centre of the lobster on the underside of the body. Slide the knife down the tail and cut straight down the middle. Turn the lobster around and cut through the top of the lobsters head and down the tail. Pull the lobster apart and clean the head area. Great served with a summer salad and a crusty loaf of bread!